Terry is a woodturner who lives and works in North London. 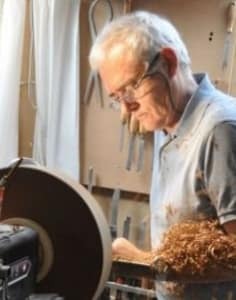 He has been turning wood for over 40 years, and has a workshop studio filled with the scent of timber, part-finished bowls and the tools needed for his work. 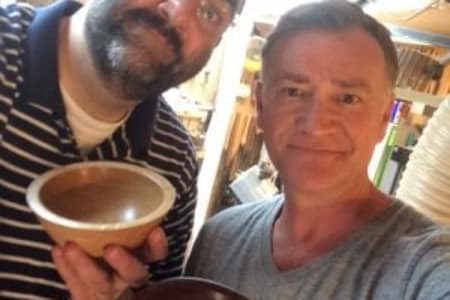 Terry made his first wooden bowl at school. It was a long time ago, but he still has that bowl. Years later, he built his first woodturning lathe out of scrap steel, and with it made his second bowl from a bit of elm. He still has that bowl too. He keeps nails in it, and every time he sees it, it reminds him just how bad a wooden bowl can be! Later, with a better lathe and more experience, he began to make better bowls, which he now sells online. Making for sale develops technical skills, and also improve the turner’s ‘eye’. Terry is passionate about woodturning and, though new to Obby, he has taught the craft for a number of years. His classes are very popular and he is proud of their consistently great reviews. It was a very fun day. I have learnt the technique of turning a piece of wood into a nice and smooth bowl in a day! I am very proud of my bowl! Terry is a super friendly, fun, patient and informative teacher. The workshop is really cool and relaxed. Highly recommended! Really lovely day, making a wooden bowl. Terry was a great teacher, who was very patient and informative. Carving into the wood and sanding down the wooden humps on the turning machine was so satisfying. Also, so nice have such a smooth feeling bowl at the end of the day. I always wanted to try wood turning and this was an excellent opportunity. I highly recommend this workshop. Terry is an experienced teacher that guides you through the process explaining each step in detail. I also wanted to remark the top quality of the equipment Terry has, I really loved his shop. We are proud of our bowls. Thanks Terry! The workshop was brilliant. Terry was friendly, patient and very knowledgeable. I felt as though I learned a huge amount during the 7 our class. It was fun, interesting, just challenging enough and a great experience overall - and I made a beautiful bowl to take home, something to really feel proud of. Highly recommended! What a fantastic experience! Terry was really good at explaining the various steps, patient and knowledgeable. Both my husband and I really enjoyed it and we are very proud of the two bowls we have created. Thank you Terry! I was given an introduction to wood turning for a Birthday present by my daughter. Thank you to Terry for such an interesting, challenging and fulfilling day, we thoroughly enjoyed the experience and came away with two quite different and professional looking bowls (works of art) which are impressing all our friends. Terry is a massively experienced wood turner but still patient and thorough explaining all stages of the process including the necessary safety aspects working with a large and very impressive lathe. The bowls were totally our own work, but Terry made sure our work was up to spec by following our progress and offering gentle hints and tips as we worked. The day went so fast that I could do it all again. We had a great time making bowls with Terry. He's an excellent teacher, very patient and really takes time to help you make sure your bowls are properly professionally finished. The day was enjoyable and informative, and we're so pleased with our bowls. I'd love to get a lathe now. We just need to get space for one first. It was a fun and informative day. Terry is clearly very knowledgeable about his subject and a good teacher. I ended up with a very nice bowl and I'm keen to have another go at wood turning in the future. Starting as complete beginners my daughter and I learned how to make a wooden bowl each from scratch in a day. Terry has expert knowledge and he communicated this in a friendly and relaxed way at the right pace. We could select from a choice of woods; I decided on Ash and my daughter on Cherry. Taking turns at each stage, we both made a bowl to be proud of, finished to an impressively high standard. The workshop at Terry's home is an Aladdin's cave of top class turning equipment and craftwork. We highly recommend his class. I bought a one day wood turning class for my husband and I for his birthday present and we thoroughly enjoyed it. Terry informed us at the beginning of the day we would come away with two bowls that would be high quality and this was definitely the case despite having never attempted anything like this before. We took turns on the lathe using different tools and techniques to craft our bowls from teak and cherry and love the results. Will definitely come back to the craft at some point in the future and have recommended Terry to friends who were interested. My daughter bought my wife and I a wooden bowl making course for two for my birthday. The day was truly excellent and exceeded our expectations. Terry’s workshop is fully equipped , spacious and professional. He made us feel very welcome and outlined what the day would involve , the safety features and areas that might be challenging to complete beginners and instils confidence. He had a great selection of wooden blocks to choose from and the many examples of his own work that are in the workshop are very inspiring. We were both truly amazed and delighted with our finished product. Many thanks Terry. For my girlfriend's birthday, I bought her the bowl making class for. 2 Terry is an excellent teacher and very patient. We'd never done any bowl turning before but Terry took us through every part of the process and promised we'd get a really nice bowl each at the end. This was definitely the case as the bowls are beautiful and impressed all my friends and family. The whole day lasts over 7 hours and includes lunch so definitely value for money. Couldn't recommend enough. Thoroughly enjoyed the workshop, thank you Terry. I had a wood turning class with Terry Vaughan last Sunday. It was a fantastic workshop. I enjoyed every moment and learned a lot. Terry was so helpful and encouraging while leaving you discover your talent. At the end of the workshop I felt very happy to accomplish turning a very nice teak bowl which I was dreaming for so long. I will definitely recommend to my friends to join one of the courses with Terry and I thank Obby too for this opportunity. It was a really fun and informative class. Vaughan was very skilled and kind and the results were superb! I would recommend this to any beginners who want to learn woodworking and woodturning. I have booked wood turning class second time with Terry again. This time we worked on a different shape rather than a conventional one. It turned out so good and thank Terry for encouraging me to try my own bowl. I use sycamore, the colour and the veins were perfect. It was a lovely experience. I would like to try again at the first availability. This was an excellent course that exceeded my expectations. The standard of teaching was very high and it was evident that Terry is a vastly experienced wood turner. Under his supervision I made my first ever bowl, from Sycamore, and it looks just great. His workshop is extremely well equipped and he supplies all the necessary safety gear. 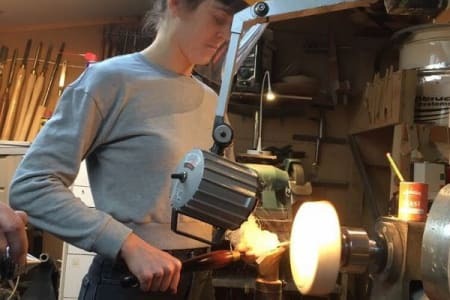 This is a completely hands-on course with step by step professional guidance on how to use the lathe, the tool rest, the gouges and scrapers, sander etc. I am now a convert and poised to buy a lathe and start woodturning in my own workshop. I thoroughly recommend this course! I am a 72-year-old lady with no practical skills whatsoever. 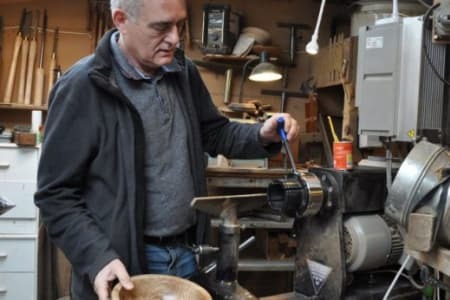 A chance encounter with a Youtube video sparked my curiosity about woodturning, as a result of which I've just had a thoroughly enjoyable one-to-one lesson with Terry Vaughan in his well-appointed North London workshop. A master of his craft, Terry really is the best of teachers. He's unflappable, extremely knowledgeable and experienced, and conveys his advice and instruction very clearly. It was thrilling to see a square solid block of wood become, under his gentle and patient guidance, a beautiful little bowl which I shall cherish always. I would love to take this new interest further, and hope to do so in the near future. I can highly recommend one of Terry's lessons. Mine was a greatly rewarding experience and terrific fun.